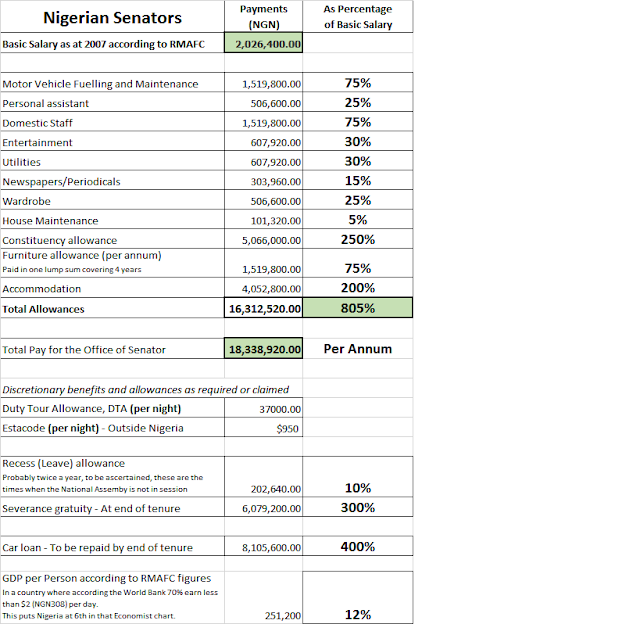 How much do we pay our lawmakers? Getting round the inscrutability of the remuneration for Nigerian legislators has been a completely fraught exercise that none of the organisations with the function of regulating such appear to have a handle on. However, when the Economist blew the lid off the exorbitant salary packages of the Nigerian Senators a few weeks ago as I wrote in this blog , the uproar that followed especially on social media meant that it was impossible to ignore and something had to be done. "Determine the remuneration appropriate to political office holders, including the President, Vice-President, Governors, Deputy Governors, Ministers, Commissioners, Special Advisers, Legislators and the holders of the offices mentioned in Section 84 and 124 of the Constitution." They have through this news story  gleaned from a newspaper advertisement released some information regarding the salaries of the Nigerian legislators but we are left with many more questions than what this red meat to the dogs of dissent was supposed to sate. Whilst the figures published by the Economist might be in dispute, the Economist asserts that their figures are for 2013, whereas the figures released by the RMAFC are in their words, ‘has been the official remuneration package since February 2007 till date’, which makes one wonder whether the salaries and allowances of our legislators have remained the same for 6 years despite inflation, the global financial crisis and two elections – that stretches the limits of incredulity, it really does. And what do they have? One might read that to mean they do not have the actual figures because, they reference that the “Certain Political, Public and Judicial Office Holders Salaries and Allowances etc, (Amendment) Act of 2008, states the actual amount being paid to legislators and other public officers, adding, however that “any other allowance (s) enjoyed by any political, public office holder outside those provided in the Remuneration Act of 2008 is not known to the Commission and the Chief Accounting Officer should be held accountable””, I guess that means they really do not have all the information. That is because, the said, Certain Political, Public and Judicial Office Holders Salaries and Allowances etc, (Amendment) Act of 2008 [Viewable here as a PDF ] does not include the salaries of the any of the legislators, however, we have a general idea as to why seeking political and public office in Nigeria is quite a lucrative career move. I can understand what Zakari Mohammed, the spokesman for the House of Representatives meant when he said, “Whatever is being written is mere exaggeration and does not reflect what is accurate. They fail to realise that what we take as salaries is different from what we use in running our offices.” Even accounting for what it takes to run an office, that would mainly be staff and other outgoings amounting to about 250% of basic salary with about 550% of basic salary in allowances to pocket. It still begs the question, what is accurate? Honestly, RMAFC, if we were to add all that into the mix, the Nigerian Senator remuneration package will come to an eye-watering 1,505% of basic salary, and the other 225% for furniture? It breaks the bank to smithereens – Nice work if you can get it, I say. The table below was derived from the figures supplied by the RMAFC  and as far as accuracy is concerned, they are only as good as 2007. Revenue Mobilisation Allocation and Fiscal Commission (RMAFC) – About page.